Organizations focus on promoting the black community. From Oct. 30 to Nov. 4, predominantly black organizations came together to host the second annual Black Homecoming, a week full of events open to all UTSA students. Two organizations are in charge of Black Homecoming, the National Association for the Advancement of Colored People (NAACP) and the Black Student Leadership Council (BSLC). “Every day was hosted by a different organization, so each organization could represent themselves, so whoever wanted to be a part of it could,” said Maria Kind, a junior kinesiology major and member of the 2017 Black Homecoming Committee. Through the BSLC, students applied to be on the Black Homecoming committee. The 2017 Black Homecoming Committee had three members: Maria Kind, Erin Young and Chizube Jiwuaku. “We didn’t tell which organization to do what, but we put together the week. We reached out to organizations, gave them time slots, and they picked what day they wanted and what event they wanted to throw,” said Kind. The purpose of Black Homecoming is to promote community as well as inform students of issues that may affect them. “The whole week is focused on the black community; it is not even just a black thing. 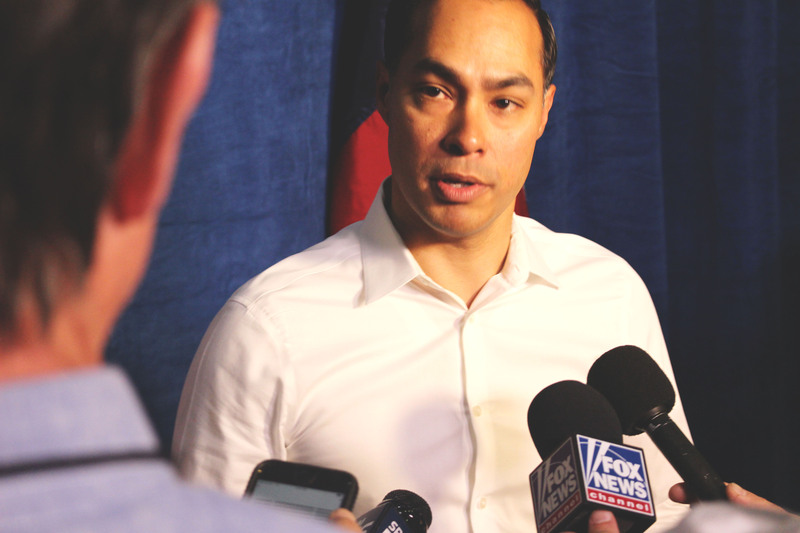 They just titled it that because a lot of people at UTSA feel like black people do not have a lot of stuff here, and we wanted to do our own thing,” said Kind. On Oct. 30, Sigma Gamma Rho hosted Black Jeopardy outside the McKinney Humanities Building and the Black Health Professions Organization hosted BraVogue, a fashion show for breast cancer awareness, in the Main Building. On Oct. 31, Youth Behind Movement and Men of Honor hosted Wild n’ Out, a comedy show between UTSA and Texas State, in the MB. The National Pan-Hellenic Council hosted Trap Karaoke, an opportunity to sing karaoke to trap music, on Nov. 1 in the Retama room in the University Center (UC). 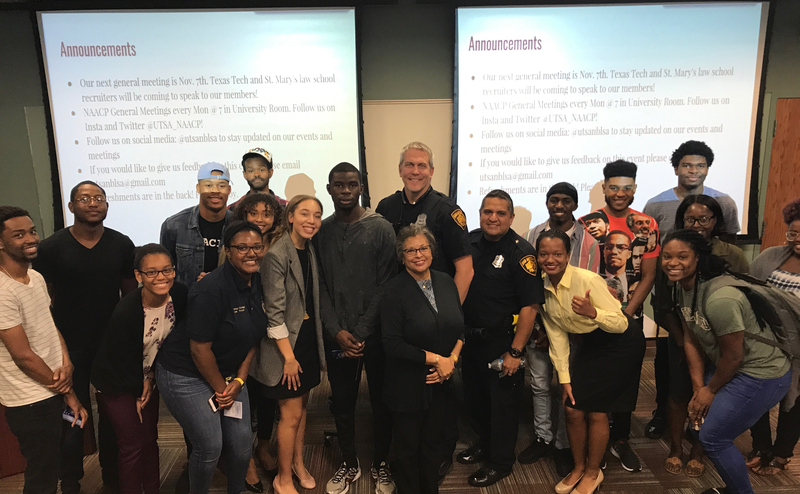 On Nov. 2, the UTSA chapter of the NAACP and the National Black Law Student Association hosted Know Your Rights, an event informing people of the rights they have on campus, in the Travis room within the UC. Embrace, an organization that advocates for natural beauty, hosted an event called Hair, Skin and Everything Within in the Denman room. Taylor Waits poses with an event shirt. The NAACP also hosted the Block Party in the Paseo where Jée Willis, a junior geography and environmental sustainability major, was announced as the 2017 Black Royalty Queen on Nov. 3. Wills went through an application, interview and election process to earn her title. As the 2017 Black Royalty Queen, she will implement her platform of raising awareness for environmental conservation, helping students get involved, having resources accessible on campus and helping unite different communities. “Being the Black Royalty Queen means, to me, that I can be there to help and to be an example to show others that you can do anything that you set your mind to and work hard for something you are truly passionate about,” said Willis. 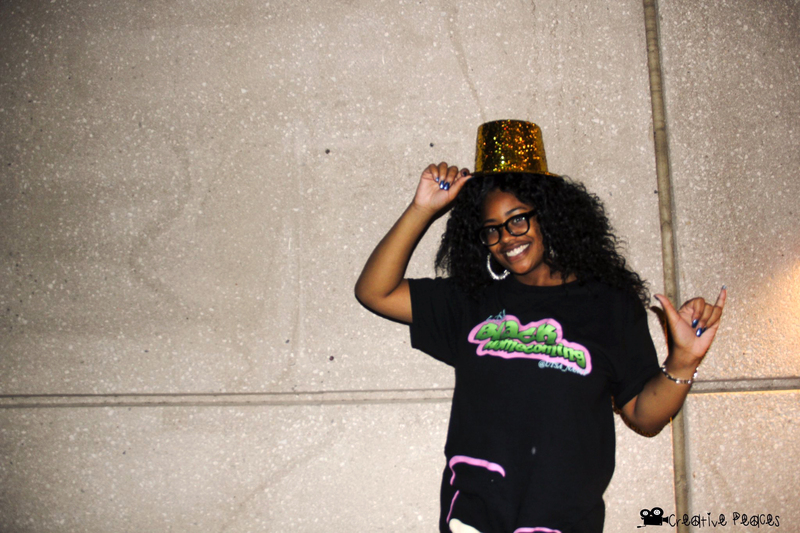 Black Homecoming concluded on Nov. 4 with the Black Olympic Games, a field day open to all students.